Do you think we will get a General Direct or a Smash Direct? Depends, if Best Buy info is legit I would imagine a general one but also it could be info for E3. There's still a lot we don't know about certain titles, so I wouldn't discard the possibility of a general one. Sakurai: Obviously the DLC comes first. That's definite. And I'm really having fun making them. It's like, "Am I even allowed to make such things from such a game? Me?" Aw man, that makes me even more certain that more DLC for Ultimate without a new Smash game for some years would really be the best option. Sakurai seems to have a lot more enjoyment out of making the DLC for Ultimate than making a whole new game. In regards to both the fans and Sakurai + his health, I sincerely hope Nintendo considers just supporting Ultimate for a long time and making it the Smash game to last the next six to eight years. We know Sakurai won't get a long break like we all want him to, given the culture of Japan and its workforce, so this really just... is the best way, I think. I agree. I think that Ultimate will have more DLC characters than just the five in the Fighter Pass. Smash is like the best selling Switch game in Japan, right? If so, then maybe they might be open to other DLC fighters, if they've kept supporting Splatoon 2? Probably a Smash Direct. In the past few years we've only gotten about 2-3 general/nonspecific Directs a year and the one from February is still fairly recent. I'm expecting a Smash Direct with Joker/Ver 3.0/DLC news to help with the E3 wait. I'm not sure we're gonna get a Smash Direct even. It's not like I expect them to shadow-drop Joker but I think that while Joker will get an overview video, it won't be as elaborate as a standard Smash Direct. Especially since I'm not sure we're getting Character 2 before E3. So Banjo’s looking like the most likely Microsoft inclusion, but are we still considering the possibility of a Bamco rep? Sure, just slap on Kos Mos or whatever. There has to be a Nintendo Direct or Mini before E3, because Super Mario Maker 2 is being released in June. It would be a very bad business decision to wait until E3 to talk more about the game, and then for it to release in the same month afterwards. So there either needs to be a Nintendo Direct that includes the game or Mini Direct specifically for the game at minimum. They can't just rely on the reveal trailer from a few months ago to maintain the hype until launch. Banjo and Kazooie were as much Nintendo characters as Bayonetta currently is. They may have been associated with Nintendo, but they were never actual Nintendo characters. Except Bayonetta originated on a non-Nintendo platform. Also during the 90s, Rare made games exclusively for Nintendo, unlike Bayo’s company. A better comparison would be Pikachu. I don't think platforms of origin matter much honestly, its a series from another party promoted by Nintendo and Bayo has exclusivity with Nintendo since Bayonetta 2 was released. Nintendo has an actual amount of ownership in the Pokemon franchise, one example is that the Pokemon names trademarks belong to Nintendo. Only thing I can say is that character comparisons are tricky. I guess none of this really matters anyway, heh. Sorta like how Nintendo had ownership in Rare. Rare developed aspects of the N64 engine even. Sorry, but Banjo was much closer to Nintendo than a simple partnership. He was about as much a Nintendo character as you can get besides being a first party developed character from Japan. 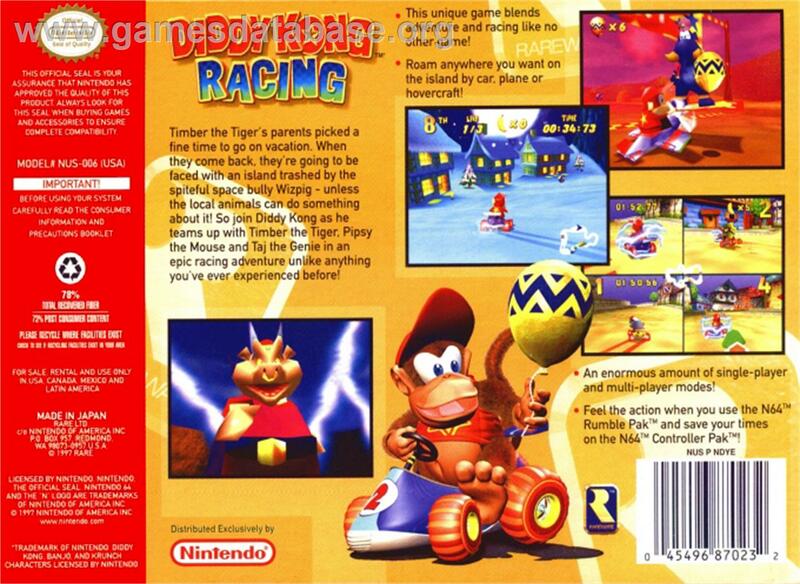 They even used him on the box art for the N64. I guess Detroit become human is good example in which way IPs are handled by publisher and developer studio. DBH was a major ps4 advertising IP for Sony. Now, the deal between Sony and QD has ended, Playstation has banned DBH from whole console advertising. Same relationship could be between Nintendo and Rare. People assume the ownership of all the IP Rare created in collaboration with Nintendo to either be of joint or sole Rare ownership, but it seems the truth of the matter, from what I can discern, with my limited knowledge of copyright and trademark, is it varied between IPs. If you'll move your attention to the bottom right-hand corner of the box you'll see ownership belongs to Rare, not Nintendo. The only exceptions to this are Diddy Kong and Krunch (as Kong and Kremling, they were characters both owned then and now by Nintendo) and Banjo. 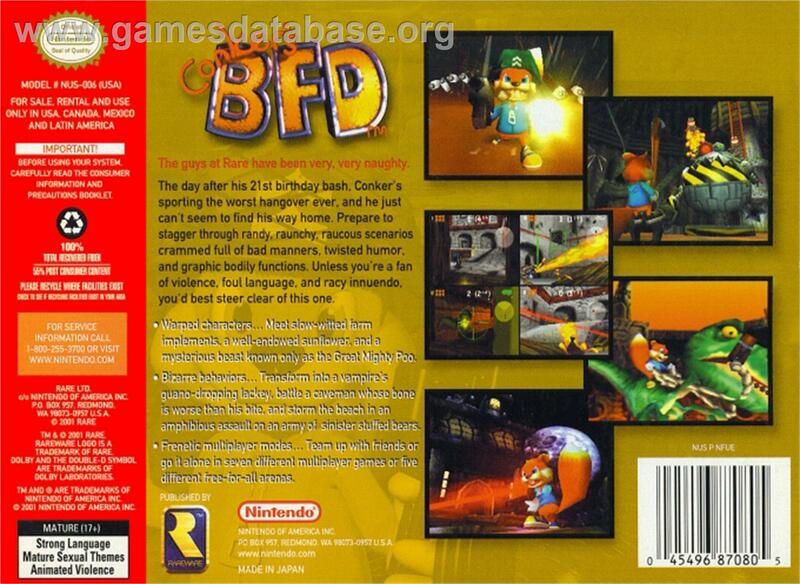 Banjo is specifically listed with the characters Nintendo owned trademark to, while, for example, Conker isn't. 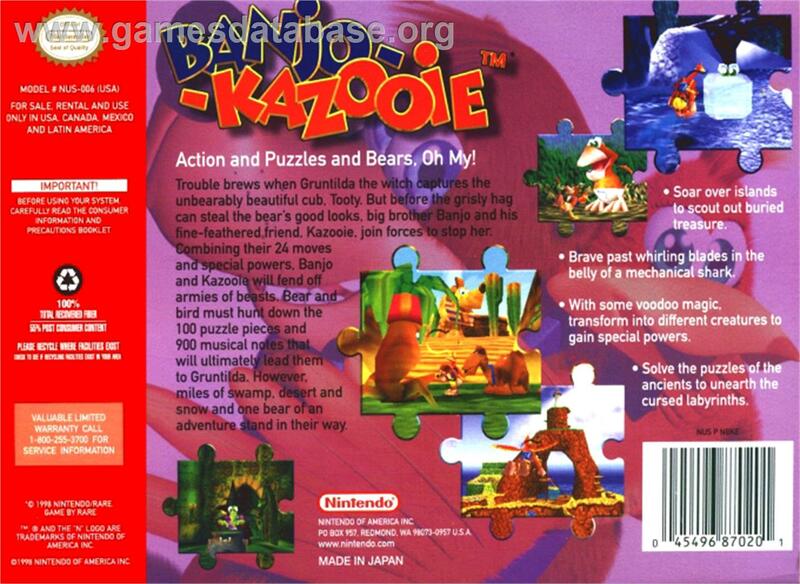 This is further evidenced by their respective games where you can see the copyright to Banjo-Kazooie (and Tooie) is split between Nintendo and Rare, much like any of Nintendo's other IPs made out of house (Fire Emblem, Kirby, Xenoblade, Pokemon, etc.). Meanwhile, the copyright for Conker is listed as solely by Rare. Additionally, the addendum of "published by Rare" is noted, implying Nintendo's role began and end with distribution. 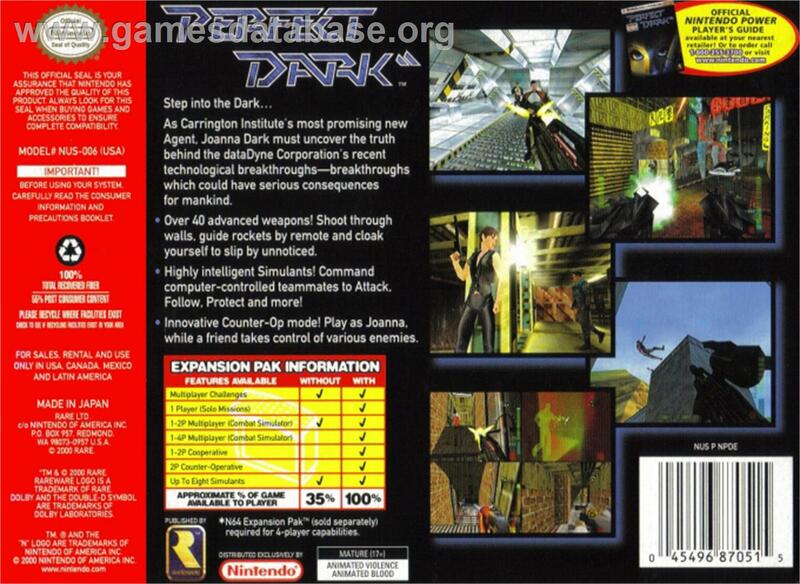 The same can be seen for Perfect Dark (where "distribution by Nintendo" is even more explicit) and Jet Force Gemini (and Diddy Kong Racing, minus some of the characters). Under those games, Rare is listed as sole owner (not that that stopped Perfect Dark content from being included in Melee, fwiw). Banjo shares this ostensible joint ownership exclusively with Killer Instinct and GoldenEye. Now, GoldenEye is a unique example, as the rights are more entangled than your average game, even one of multiple rights holders. However, Nintendo still owns some aspects of that game (as evidenced by the debacle surrounding its digital re-release some years back). This sets an example of Nintendo owning/having owned part of the Rare games on which they are listed as copyright holder. That said, the more pertinent example would be Killer Instinct, as fewer parties are involved, and it corresponds to the entire IP, not just a standalone title. On the console releases the legal information mirrors that of Banjo. However for the arcade releases, despite Rare developing the games, and Midway publishing and distributing them, Nintendo, who presumably had little hands-on involvement, is still credited as joint copyright owner and sole trademark owner, which are the same qualifications surrounding Banjo. To that end, given that, to my knowledge, Nintendo owns some aspect of every series created under them whereby they are listed as a copyright holder, I posit that it is significantly more unlikely Nintendo owned none of these two IPs (past distribution rights) than for these to be the sole exceptions in the history of the company (especially when there is the distinction among Rare IP regarding Nintendo as copyright holder). So going off the Platinum example, I'd say Banjo (and Killer Instinct) are more like Wonderful 101 and Astral Chain than Bayonetta, who would be more akin to GoldenEye, where Nintendo owned part of that game, but they don't own the IP. However it's also rather incidental, as Perfect Dark content still made it into Smash. Were Nintendo and Rare not going through their breakup, I'd assume it'd be no harder to include a series Nintendo seemingly had a greater claim to. EDIT: Literally all the pics are/were broken (-_-) so I inserted links. Plus some new/existing 3rd party Mii costumes maybe, and at least one newcomer; this one guy had this hunch we might be getting two. It would mimick Smash 4's DLC directs (or at least the Roy/Ryu one? ), there's that Sakurai thing where he said they were working on three of the characters including Joker, and maybe Nintendo would not want to have a hype DLC reveal potentially steal the show of their E3 presentation, especially after last year's was heavily Smash focused. If that WERE to happen, it'd be a nice dump of the information to tide us over for the time being. I don't expect the next DLC character to be revealed during this month. -The final two characters will get revealed in a direct at the end of the year. As far as Namco reps go I think they'd pick either Heihachi or Lloyd. After looking at a few move lists, I think that Heihachi would be a pretty aggressive rush down character that can counter projectile characters, but doesn't have a good vertical recovery. He would probably face the opponent in 1v1's like Ryu and Ken, and could even have weird button inputs involving diagonals and combo exclusive attacks. Heaven's Wrath: A boring counter move. Wave Dash: A dash forward that has some invincibility, and ignores projectiles. Demon Scissors: Like Soaring Axe Kick, but much worse. Raijin Stance: A stance that allows Heihachi to do a few more powerful attacks. Lloyd would probably feel pretty vanilla to those who don't already know of the character. If he's using his legendary weapons then his attacks could have different properties based on which direction he's facing, but other than that I don't foresee anything noteworthy other than annoying online players with "Demon Fang!" "Demon Fang!" "Tempest!" "Demon Fang!" "Demon Fang!" "Rising Falcon!" Then again, they did say Joker would be coming "by the end of April," so I don't really get why people keep expecting him to come out early this month. They told us he would likely be coming later rather than sooner. It could be very well development time. Last time in Sm4sh DLC it took from E3 in June to November to get the reveal of a new character and after that it was released on December. So a 4-5 month development (considering it started between Nov. and Dec.) is not outside the realm of possibility. I am calling it. The fifth and final challenger pack of the pass will be revealed at The Game Awards 2019. I doubt it's for playtesting. They've already finished him by now and are just holding off till they can sneak it in with a direct announcement of P5Switch so they can do "Out now!" or something like that. Citation needed. We don't have insider knowledge for his development (at least I don't have). Sm4sh DLC also had the ballot, so the huge time span makes sense since they wanted to gather the results. I'm theorising that they're working on other characters right now. After all, Bayonetta and Corrin were announced during the same direct, meaning they were developed simultaneously. The citation is game companies don't continue development less than a month before releasing things. We know for a fact that April is both 3.0 and Joker's launch date meaning this has been planned since at least the last direct to launch on a specific date in April. Any edits to Joker's stats and/or moves at this point would be setting up the developers for some damn tight time-crunch patching. He stole the hearts of all of Sora Ltd., changing their original ideas to lean towards giving the Phantom Thieves some love via their head honcho. Joker's just been steepling his fingers and enjoying the outcome of his intervention. It goes beyond stealing an invitation; it's stealing the hearts of all of us. Source: My grandmate's roomson's friend works at Nintendo, trust me. i would be surprised if we didn't tbh. ultimate will be there as a nominee and a smash direct to reveal one character is unnecessary. we might get a mini-presentation after the reveal but it makes more sense to reveal something at TGA. Not gonna lie, I didn't think of Team Rocket in Smash until I saw it in this thread. They'd make a great foil to the Pokemon Trainer, and star KOing them would be the funniest thing ever. Kudos to whoever supported that from the beginning; I don't see it happening, but I'd love it. Bonus points that Koffing, Meowth, and Wobbuffet were in previous Smash games at least. Yes, I agree Team Rocket would make a great foil to Pokémon Trainer and Pikachu. I picture Team Rocket as a two-teams-in-one fighter. Like meets or or . The two teams are and . Down+B would have Jessie and James take turns summoning their Pokémon. Ekans and Koffing don’t have arms or legs. They wouldn’t work as stand-alone fighters. But Meowth have arms and legs so Meowth would be the main fighter. Ekans and Koffing would team up with Meowth. You know... my window for Pokemon wants shut indefinitely when PT came back. That’s the peak of Pokémon inclusions for me, and I don’t see any other Pokémon character out hyping it on a personal level. .... unless Team Rocket gets in! I don’t know how likely they are, but I support them. A lot. April Nintendo Direct date possibly leaked, my bets on fighter #72 that is set to be announced in this direct, should be Erdrick from DQIII. Ah, it's been about time. I was wondering on how long Nintendo would push this out. I'm taking it with a grain of salt since the February Direct is still really recent and that site has been wrong numerous times in the past. Still, if it's true it'd come on the day right after my senior presentation so I'm really hoping it's real. They're going to have to have another direct in order to show off more of Super Mario Maker 2. We'll also know if the Best Buy leaked games (Metroid Prime Trilogy, Zelda Link to the Past, and Persona 5) are real here. Smash will also most likely get a massive section dedicated to itself, where they will show off Joker gameplay footage and reveal the Persona stage (which has been leaked to be Mementos) that will be releasing alongside him. The content of the 3.0 update will also be shown off, and if we are lucky, they will tease the second Fighter Pass character.